Posted on Mon, Apr 9, 2012 : 5:59 a.m. It it's nearly midnight, you're stuck writing a research paper and you can't find the information you need, despite an hour searching ProQuest. Who do you call? A University of Michigan librarian, of course. Or in this increasingly Internet-focused age, you chat them. U-M has operated an Ask a Librarian instant message service since 2007 and the service continues to significantly grow in popularity, says program director and U-M librarian Karen Reiman-Sendi. "(Users appreciate) experts who are providing the instruction and the help. It's convenient in that I can stay wherever I am in my location and get that help and it's efficient," she said, adding that one recent Ask a Librarian user was so pleased with the service the user called librarians "magical people." According to Reiman-Sendi, librarians running the online chatting service try to "demystify" complicated research quandaries for students and faculty. These demystification services are available to U-M faculty and students, as well as outside researchers trying to access U-M library items, 77 hours a week during the academic year and until midnight most weeknights. Despite the late night hours, Ask a Librarian receives most of its inquiries between 11 a.m. and 5 p.m.
You can text a librarian your inquiries, as well as submit them over email and phone. "It's been really helpful when I've had specific questions (and) I was freaking out about writing something," said senior anthropology and environmental science major Jen Morris. "It's a really nice feature because it allows you to talk remotely." The resources that librarians direct users to, however, are not always remote. Oftentimes, librarians can point researchers toward online databases available to students through their U-M accounts. Nonetheless, the data some students need may only be available in a book stowed away in a campus library. "It definitely has its limitations," Morris said. In some ways, those limitations are purposeful, said Reiman-Sendi. The service is available to assist students, not necessarily to give them the answers. "We're not a service that says 'Oh you’re going to get your answer in two minutes if you contact us," Reiman-Sendi said. "Our online presence is just like the service that we would provide face-to-face. We are asking students, 'What's your topic? What are you looking for?'" Text message them at 734-531-9ASK (734-531-9275). 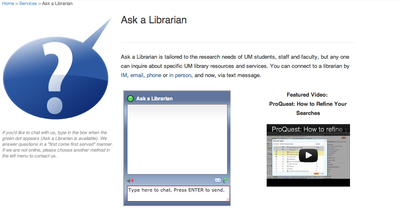 In 2010-11 librarians answered an average of 836 questions over instant messaging per month, for a total of 10,031 questions that academic year. The number of inquires has increased to an average of 931 per month during the 2011-12 academic year. Additionally, it turns out more people are chatting with librarians than emailing them. Ask a Librarian receives an average of 349 email inquiries a month. Users like the instant messaging service because they can speak "live" with the librarian, Reiman-Sendi said. The service is also staffed by librarians with varying expertise, which students and staff find helpful. "We’re drawing on lots of expertise. If you went to a physical desk, face-to-face, you could ask an engineering question but you wouldn't necessarily get the same answer you'd get if you went to an engineering librarian," saidd Reiman-Sendi. "People find it convenient and they find access to experts to be critical." In 2010, Ask a Librarian launched a pilot texting service that allows interested researchers to send their questions via text. Although that program is still relatively young, Reiman-Sendi expects the convenience of texting to attract a growing number of students to the service. Between March 2011 and January 2012, Ask a Librarian handled 101 text-based inquiries, ranging from citation styles to complicated research questions, according to a U-M report. U-M is far from the only university of offer the instant messaging service. In Maryland and Oregon, the public universities and library system pool their resources and offer statewide instant messaging services. Other schools, such as Virginia Tech University and the University of California, also offer the chat feature. "Really, truly this is a staple in most library systems and in higher education," said Reiman-Sendi. Mon, Apr 9, 2012 : 2:39 p.m.
What's the news hook? They've been doing this since 2007.....? Mon, Apr 9, 2012 : 2:52 p.m.
Fair question, Bonsai. We wanted to let people know about the program's growth. If you have any interesting ideas, even if they aren't necessarily new, please send them to kelliewoodhouse@annarbor.com. You'd be surprised about how often you can find a hook in something that's, well, not new. Thanks for reading. Mon, Apr 9, 2012 : 2:09 p.m. The UM Ask A Librarian service is actually only staffed by UM employees. Many of the evening and weekend hours are staffed by graduate student employees, but all work for the UM Libraries. Mon, Apr 9, 2012 : 1:55 p.m.
&quot;U-M is far from the only university of offer the instant messaging service. In Maryland and Oregon, the public universities and library system pool their resources and offer statewide instant messaging services.&quot; No need to look to Maryland, Oregon, etc. to find other examples--EMU's Halle Library offers the service, too. And if EMU and U-M are using the same Ask-a-Librarian feature, the headline may be misleading: the librarians are working off-site (either in another city in Michigan or another state altogether) and not employeed by U-M; hence, the &quot;magic&quot; 77-hour work weeks. The librarians are actually logged on usually at the University Libraries or at their homes. I don't know how the EMU system works, but at U of M, many of the librarians working the reference desks also field chat inquiries.